Happy Monday!!! 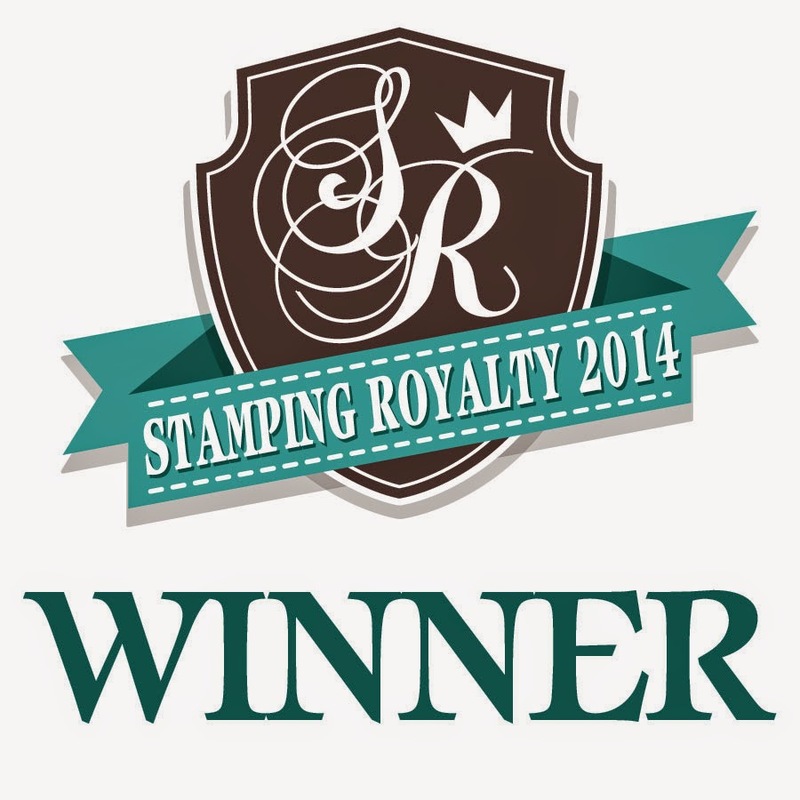 Time for another Totally Stampalicious blog challenge and this week we're keeping it clean! LOL, and by that I mean the layout and embellishments. I thought this Freshly Made Sketch was perfect for the TS challenge. I also took the "clean" theme one step further and decided to not color my image. I'm a little unsure about it. Feels nekkid to me, ha! But I also think it's a perfect card for my boys to give to their dad. This cutie is from the Occupation Bears set that was recently released. The only embellishments are a little thread and 3 small buttons. Oh yea, I also cut out a border with one of my dienamics and added a little faux stitching. Now swing by Totally Stampalicious because we still have Dessert Menu special going on!!! Don't miss out! Hi all! I hope everyone is doing well in dealing with the crazy weather we've had all over! I know some storms rolled through here around 5am and woke me up! Moving on... here's my card for the latest MFT WSC. I used little miss Cause for Celebration, which, because of the sentiments, you may feel is geared more towards New Years. Well, obviously she's ready for ANY type of party with that pretty dress and noise maker! I colored her to match the dp, which she does by the way, despite what this pic may show... you know how that goes! The sentiment is from the First Class Friends set. The inside sentiment is from the Sweet Greetings PI set. Hi all and happy Monday! Here's my card for this week's Totally Stampalicious challenge - For the Men. Who doesn't love Gus?!?! The old man cracks me up! I paper pieced his boat and colored everything else with copics. I took a little paper clip and bent it so it was more like a fishing hook then attached the sentiment! Ha! My only other embellishments are a strip of twill and a zig zag dienamic border. Thanks for stopping by! Be sure to see what the rest of the talented TS crew have for you! See you all back here in the morning for a new Totally Stampalicious Monday challenge! Hi all! 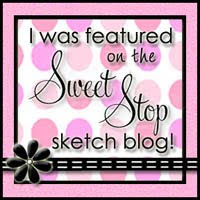 I wanted to share this card which I made for Karen G's Sweet Sunday Sketch. This is my first time inking up the Buckets of Love set from There She Goes. With Valentine's day around the corner, I decided to use the hearts. I had to add the extra strip for my sentiment. I used two dienamics, some brads and my piercer to add the finishing details. 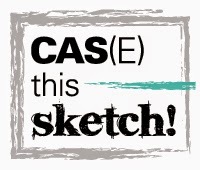 Hi and welcome to another MFT sketch challenge! I had this Crazy for Daisies PI inked up and she was staring me down, so I figured I better use her! She was colored with copics and is up on pop dots. The smaller kraft layer was cut out using the First Class Friend dienamic. I also used one of the mini rolled roses, one of the mini tab foursome and the postage border dienamics (on the inside). I decided to continue the rounded corner theme from the First Class Friend dienamic on the bottom corners of the card front and on the inside, as well. I finished it off with some bling on the mini rose, some taffeta ribbon and two different embossing folders. Thanks for stopping by! Hi and happy almost afternoon! I apologize for the late post! My husband's Giants won last night and we celebrated with friends. So here's my card for this week's Totally Stampalicious challenge - Sweethearts! I used one of the newly released sets, Monkey Love. These monkeys are TOO CUTE!!! He was colored with copics then cut out and popped up on pop dots. I'm so happy I got to use some of the heart shaped bling that I got oh, probably over a year ago. I finished it with a felt heart, a glittered "u" and some sparkly ribbon. 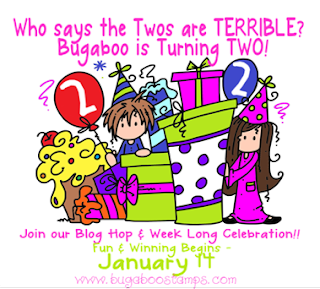 Hi and Welcome to the Bugaboo Birthday Blog Hop! 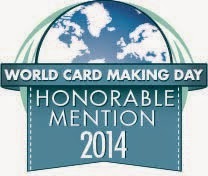 I'm honored to be a part of the celebration and I know you've seen some wonderful creations already! 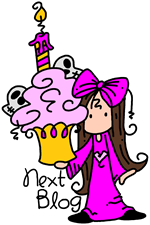 Obviously we have a birthday theme going on so here's my card using the Balloon Girl which you can find on the Bugaboo site HERE. She's also a part of the Sweet Kids set from Totally Stampalicious, which you can see HERE. The sentiment is from the TS set. This sweet girl was colored with copics and you can't have a birthday card without a little bling! How would you like to have this precious digi image for yourself? Well, simply leave a comment on THIS POST for a chance to win!!! I'll draw a winner on Sunday, January 22nd. Hopefully you arrived from Paul's blog and if not, click on the cutie below! 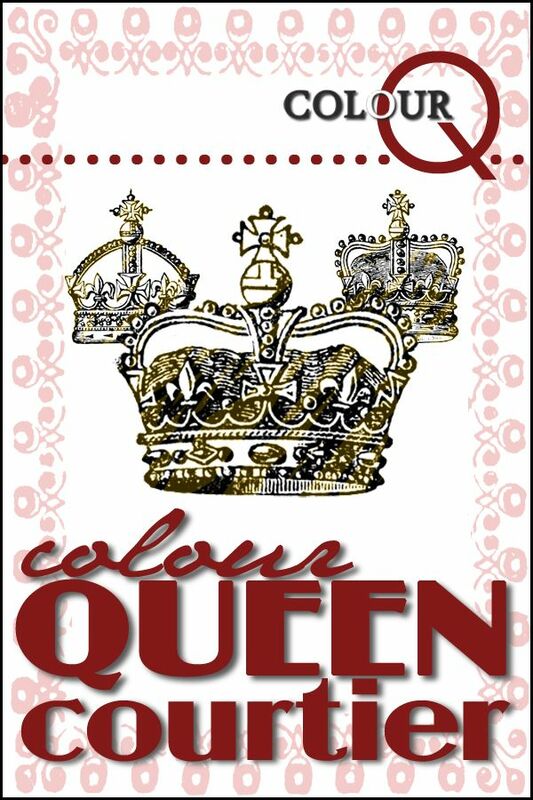 Now click on the little princess below and you'll get to the next stop on the hop, Samantha's blog! Thanks for stopping by and enjoy the rest of the hop!!! Hi! Everyone ready for the weekend? I know I am! Here's a card I made for the Flourishes Blog challenge for their new release. The paper pieced bassinet is from their Baby Love set. I used a few different dienamics ~ file tab, dizzy border and fringed perennial. I've had this pretty shiny ribbon for years and am happy to finally use some of it! This card measures 3 5/8 x 6. I know, a little odd but I like it! A peek at the inside. The heart was cut out using a dienamic from the homespun birdhouse die set. The sentiment is from the Flourishes set called Friendly Reminders. A row of pink bling finishes off the inside. Hi and happy Wednesday! Time for another MFT sketch and here is my take on it. I decided to use this a la mode, Hot Cocoa Cutie. The sentiment is from the Who's That Girl set Gets Cozy with Cocoa. She's colored with copics and is up on dimensionals. Thanks for stopping by! 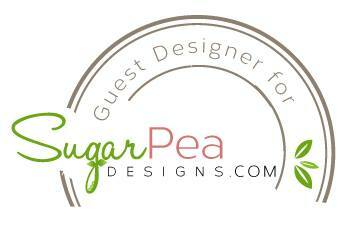 Be sure to stop by the MFT Blog to get links to all of the DT creations! Hi! Here's a card I made for the first MFT wednesday sketch club challenge of the year! I used this week's Color Throw Down challenge which was black, grey and red. The only stamping on this card is the sentiment on the front and the "XO" on the inside. The heart is cut out of MFT felt using dienamics. I used a couple of other dienamics on here and finished everything off with big brads and a button with twine. 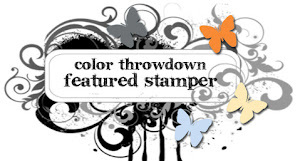 Hi and welcome back to a whole new year of Totally Stampalicious challenges! We're starting off the new year right by challenging you to put a smile on someone's face with a FUNNY card! I decided to use this newly released Gus Fishing stamp set. You've just got to love this old guy! The sentiments in this set will crack you up! He's colored with copics. The colors came from the PDCC113 challenge, the layout is DS33 and it also fits RCC34. Thanks for stopping by and be sure to check out all of the FUN creations over on the Totally Stampalicious blog! Happy New Year from Totally Stampalicious!!! 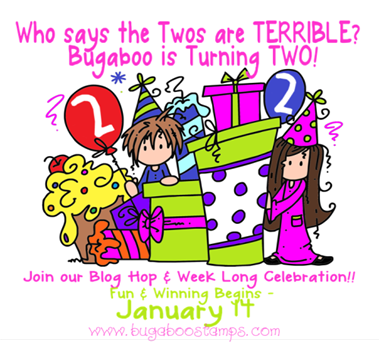 Welcome to our FIRST RELEASE of 2012 BLOG HOP! YOU could be a WINNER!!!! Here's my card using Monkey Love! He is TOO CA-UTE!!!! There are two cuties in this set with several perfect sentiments! He's colored with copics. I know you have LOTS of goodies to hop to so here is the entire line-up in case there are any glitches along the way!! Enjoy the hop and don't forget to leave comments on your way!!! Then HAPPY SHOPPING! And Happy New Year!!! Hope everyone had fun ringing in the new year! 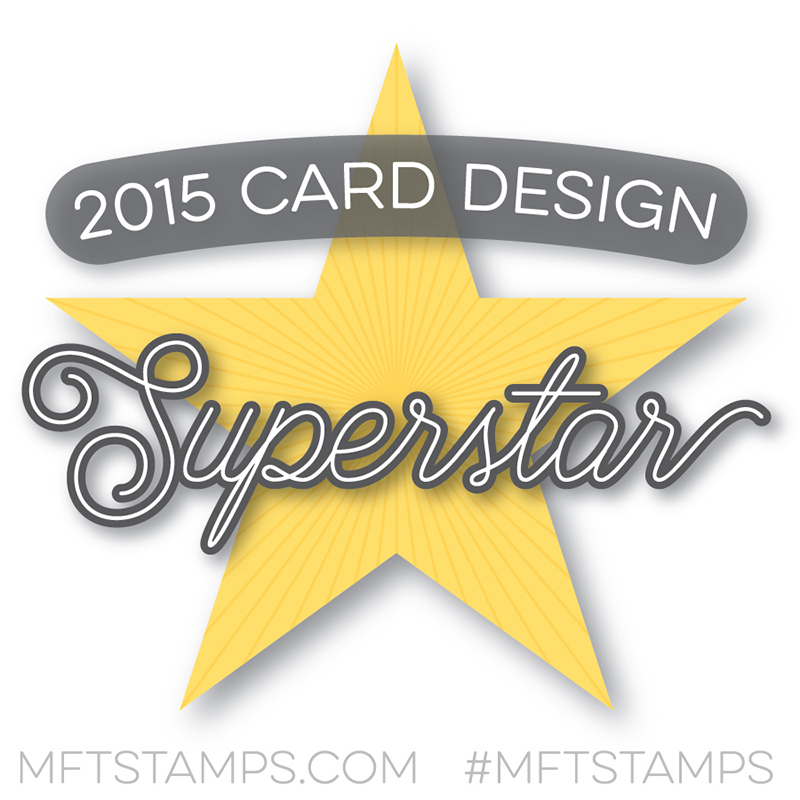 Here's a long 9 1/4" x 4" card I made for the latest MFT guest designer challenge which is to paper piece! 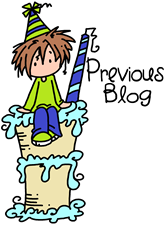 My birthday was yesterday (yes, on New Years' and yes, my mother calls me her hangover and no, we're not going to discuss what age I am now! ha!) so why not make a birthday card?! The PIs I used are Hello Cupcake, Crazy for Daisies (inside) and Aim High. The sentiment and little frog are from the Feeling Froggy PI set. I used the Flat Bottom Clouds dienamics to cut out the blue dp then filled the cut outs with white corrugated flat bottom clouds. The Branches with leaves dienamic was perfect to have the Mini Pennant "Happy Birthday" banners hanging from, which is stamped using the Banner day alpha. Now for some detail shots... here you can see that I stamped the cherry onto textured cardstock and added glossy accents to make it shine. I also hand cut every. single. sprinkle. on that cupcake! The frosting was stamped onto a "chocolate" textured cardstock then layered on the polka dot dp cupcake "liner". Her shoes were also stamped on and cut out of textured cardstock. The "grass" was cut out using the medium simply scallops dienamic. This sweet girl has two different dp's used on her dress and look! Her socks match the top half of her dress, then I pieced her white shoes on top of those and added more glossy accents to them so it looks like she's wearing some darling patent leather shoes. Also, you can see that sweet little frog has also been paper pieced and has glossy accents on him because after all, frogs are shiny, right?! And now on the inside I used the First Class Friend dienamic for the sentiment which is accented by a line of silver pearls. Little Miss Crazy for Daisies has her dress paper pieced using two different dp's, as well. Her shoes were also cut out using textured cardstock. Silver brads on the front and faux stitching inside and out finish everything off. Thanks a ton for stopping by! Here's to a CRAFTY and EXCITING new year!! !